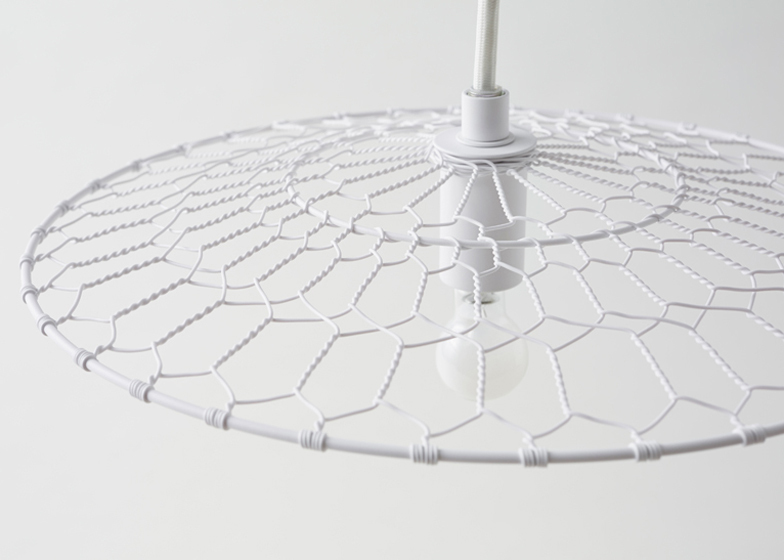 Japanese studio Nendo has worked with artisans in Kyoto to design lamp shades based on traditional wire netting cooking utensils. Nendo teamed up with Kyoto company Kanaami-Tsuji, which produces traditional kanaami kitchenware used to dip foods like tofu into boiling water. "Wire netting cooking utensils made by Kyoto artisans have been employed to create Kyoto's delicate, exquisite cuisine for over a thousand years," said the studio. To create the Basket Lamp, copper wire is twisted into a geometric mesh around concentric circular frames. This forms a shape that slopes down gently from the light fitting. The mesh is powder-coated in black or white paint to finish. "The design allows the handcrafted shade's beautiful woven pattern to reflect on the ceiling," said the studio. The lamps are sold exclusively at Japanese department store Seibu. Other projects Nendo has designed for the store include watches with graphics taken from a draughtsman's tools and flexible polycarbonate reading glasses.